The movements of more than 300 000 stars surveyed by ESA's Gaia satellite reveal that rare close encounters with our Sun might disturb the cloud of comets at the far reaches of our Solar System, sending some towards Earth in the distant future. Tracking stellar motions. Click here for details and large versions of the video. 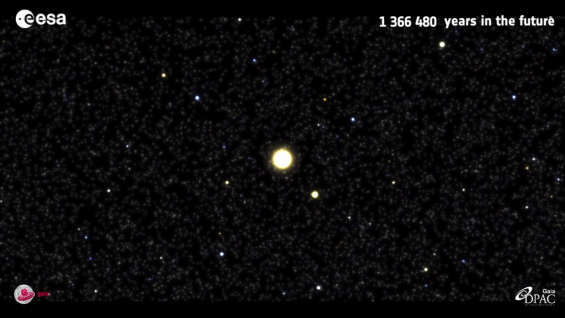 As the Solar System moves through the Galaxy, and as other stars move on their own paths, close encounters are inevitable – though 'close' still means many trillions of kilometres. A star, depending on its mass and speed, would need to get within about 60 trillion kilometres before it starts to have an effect on the Solar System's distant reservoir of comets, the Oort Cloud, which is thought to extend out to 15 trillion kilometres from the Sun, 100 000 times the Sun–Earth distance. While the 16 are considered reasonably near, a particularly close encounter of one star, Gliese 710, in 1.3 million years' time, stands out. 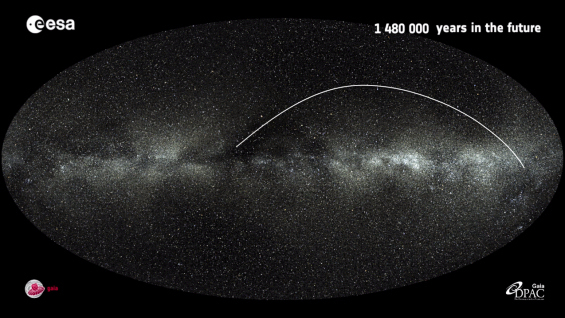 It is predicted to pass within just 2.3 trillion km or about 16 000 Earth–Sun distances, well within the Oort Cloud. That equates to about one potential 'close' encounter every 50 000 years or so. It is important to note that it is not guaranteed that a star would actually perturb any comets such that they entered the inner regions of the Solar System, and even if they did, if Earth would be in the firing line. "The completeness-corrected rate of stellar encounters with the Sun from the first Gaia data release," by C.A.L. Bailer-Jones, is published in Astronomy & Astrophysics.